The good news is that, along with a title change, Starship Prometheus brings with it a whole new set of CGI effects sequences of starship and shuttecraft exteriors, as well as a couple of new space exteriors re-chromakeyed into scenes where an outside ship is viewed from inside another ship. The new animated CGI sequences look gorgeous and were done by JOERG SOELLNER. If you look closely, you’ll notice that the original version ran 45 seconds longer than the new version. Where did the time go? 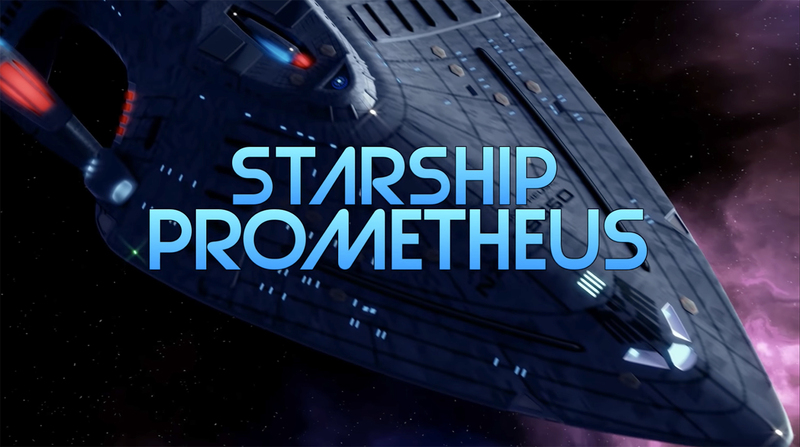 David Whitney removed the brief cameo of Seven-of-Nine from the closing credits for Starship Prometheus. Voyager Continues will no longer, er, continue. 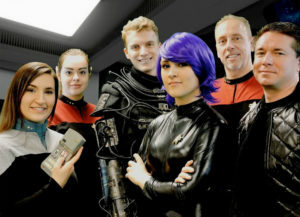 Although Raven didn’t focus on the crew of the USS Voyager lost in the Delta Quadrant, it did serve as a lead-in to was was to become a new Voyager Continues fan series. In 2017, the first episode dedicated to just Voyager was released: “Derelict.” It only featured two actors (playing Seven of Nine and Harry Kim) plus an incredible voice-over of Captain Janeway that may well fool you into believing they somehow got Kate Mulgrew for their fan film! It was a solid 10-minute production and showed promise for what would be one of the only Trek fan series focusing on the crew of the Voyager in the Delta Quadrant. I’m only going to be doing Star Trek parodies and spoofs that have the name Trek in them. I’m scrubbing Star Trek canon and logos from future dramatic films. If I make a really great film and spend a ton of time on it, I do not want to risk CBS flagging it. I already have a concept and actors and non-canon ships for the next film. I was very put off about the Stage 9 game project getting the cease and desist. To be fair to CBS, the Stage 9 virtual walk-through of the Enterprise-D, which was recently shut down as an unlicensed Trek project for potentially competing with a licensed Trek game, was not a fan film. By all accounts, CBS has been going much easier with Trek fan films, having allowed Star Trek Continues to complete four episodes in violation of the guidelines, giving Starship Republic permission to distribute perks for their crowd-funding campaign in 2017, and reaching a compromise to allow Temporal Anomaly to exceed the two 15-minute segment time limit in exchange for removing clips of the TNG cast and creating an original score (rather than using copyrighted music). Of course, David is the head of Starfleet Studios, and so the decision of what to produce remains his to make. It is a relief, though, to know that he will continue to release fun Star Trek parodies like the entertaining QUICK TREK improv shorts. And I’m eager to see how his non-canon offerings end up coming out. But I will miss that Janeway voice-over actor. That impersonation was uncanny!